I want to be a good person. I want to be better than I could ever imagine. Like, Mom-better, Auntie-Myrtle-better, Grandma-GG-better but I fall so short. I have been taking to heart Tracy’s advice a few years ago about caring for my spirit and my ‘insides’ and then other things will more naturally fall into place. I’ve read the BofM two times in the past year [starting at April and then October Conference] and am starting again. I studied in depth the New Testament last year with our Church Gospel Doctrine study program. I pay tithes and offerings, try to keep the Sabbath, and not kill anyone, although sometimes I feel the need. I attend Church, the Temple, help others in need. But I fall so short. I can feel the pain in my gut when I think what a hypocrite I am and when ugly thoughts come to my mind so quickly and easily. Almost like a default settting. Ugh. I struggle with having snarky thoughts about others, even total strangers. I struggle with a challenging marriage. I struggle with keeping my own opinion to myself. I struggle with genuine kindness and patience and charity and service. I struggle with keeping my house clean. [Mikelle won’t even come here anymore.] I struggle with gossip and one-up-man-ship. I struggle with lots. I struggle with saying my prayers. With taking care of my body responsibly, with saying a kind word instead of thinking I need to say whatever comes into my brain. I struggle. I so want to recognize good, to be good, to be The Good. I want to feel joy inside instead of an ulcer burning in my gut. I want to be transparent, to have integrity, to be consistent and trustworthy. Today when I saw this picture it left me feeling scared and uncomfortable. Because I knew that I would have a hard time recognizing the Savior. 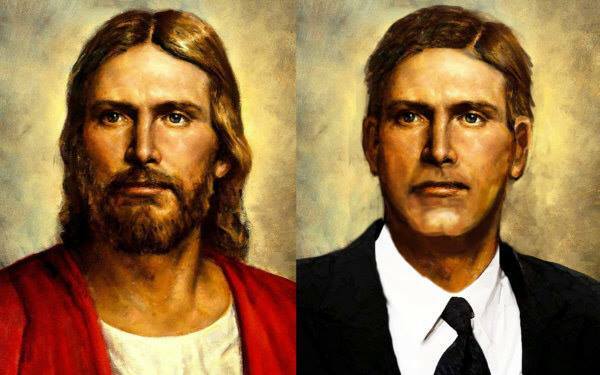 [Granted this is just a picture, an artist’s rendition of what he believes the Christ to look like and then another picture to the side– I get that.] But, I don’t know him like I want to know him. I most of all, want to deepen and strengthen my knowledge, my love, and my dependence on Him. I want to be real. I’ve lived in such a fog for so long, just getting by, just going through the motions, just pretending, just existing. I don’t even know, sometimes what real really really is. You keep on trying. Keep on striving. Keep on praying. Keep on trying to choose Him. It is hard for each of us to be good and kind and real. He loves you and is drawing you closer as you keep on trying to give Him your heart.